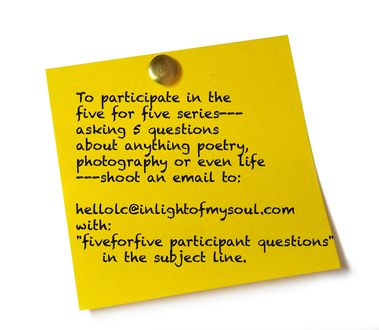 Five For Five PT 4. discussing writing growth and the joys of the craft. exploring the can and can't of writing. 1. What will you miss most about your MFA program? I think I will miss the community the most. The program was small and close knit, everyone was understanding, there for one another and made whatever accommodations needed to make your time there work with your life outside of the program. My classmates and professors were silly, honest, encouraging and open. They definitely challenged me, guided and encouraged me whilst in new territory, and brought out the best in me, through my personhood and writing, so I definitely will miss them. 2. If it is possible, what is the most valuable piece of advice you receieved or the most important thing you've learned from being in the program? I've learned so much in the program, I suppose for simplicity sake, I would say that the most important thing I've learned was to trust myself and my response to my own writing... so when l am looking at my work say, during revision, and I'm questioning wether to take a line out or if something makes sense, just trust that I am doing the right thing for the sake of the poem..to not second guess myself. One instance of this is, I use to feel a little insecure because I tend to write lengthy poems but I learned to trust the length of the poem as well as know when the length is working or not working, so now I don't feel insecure, now my friends and I make jokes about my long poems. 3. When you started your program, what did you envision happening afterward? When I started at LIU, I didn't have a post grad vision for myself. I chose to get my MFA because I felt that it was what God was calling me to do in that season. All I cared about was enhancing my craft and becoming a better writer. Maybe I was too head over heels with writing that I couldn't see it in context with life itself, (the make money part of life because we all know society does't value poetry openly nor see its value through an economical lens) so I didn't have any specific plan or vision, I just focused on writing. 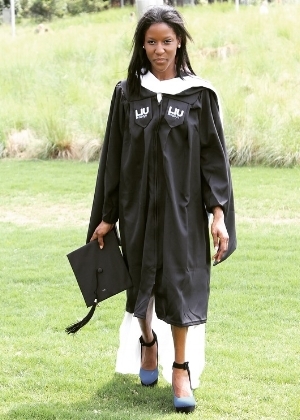 Now that I have graduated, I am learning to trust God as he's leading to and through different ways of living life while being able to still write and use my writing to impact others. Even though I didn't prepare myself the way "normal people" do for life stuff outside of writing, I don't have any regrets, my vision now is being constructed by prayer, trusting in the unknown and taking chances. 4. Describe your thesis and its process. What was the hardest part of your thesis? My thesis is titled, The Shape of An Apology; it is a collection of poems as a social and personal investigation of identity, femininity, and the black body. These poems question and explore race, gender, sexuality, grief, vulnerability, and healing. We are constantly having to apologize for our bodies, for our skin, for all we cannot change, and these poems are a testament to both the defeat and the triumph of self-love and the refusal to be sorry. The process of my thesis was both challenging and fun. When I began I didn't feel like any of the poems that I wrote throughout my time in the program fit with what I wanted my thesis to be, but the more I looked back I was able to find many of them worked. I knew what I wanted my thesis to be, or least I thought I did, but as I continued to work on it, it ended up becoming a new shape and that was surprising and exciting. The hardest part of my thesis was coming up with the order of the poems and the title. 5. What are you doing now? Have you’ve been able to make time to privilege your writing? Post MFA, my living situation has been difficult and so has the employment process but to say the least, I am trucking through life with poems on my back. As for writing I am continuing to work on my thesis and getting myself a book out into the world. Needless to say, even though I am not writing every day I am still writing and engaging in the process. I feel that no matter how busy or chaotic my life may get I will still find time to write because passionate about it, so it's important to me and for me to write no matter what. It doesn't mean I will write full poems every day, but as long as I am writing I am okay; even if it's journaling or writing tweets and instagram captions. A. Do you ever have any regrets about getting an MFA? Not at all, I know that it was necessary, worth it and all according to God's plan for my life. B. What was the first thing you wrote post MFA and what are you writing right now or have written recently? The first thing I wrote post MFA was a cover letter for a potential job, but seriously as for poetry, the first poem I wrote post MFA was called "Love Isn't All I Need" and right now I am working on some poems but they don't have titles yet. 1. When it comes to writing, what is something that you regret most? or what has been your biggest mistake? especially not going because you never heard of or know of the work of the writers that are reading is stupid. I mean who knows, they may not be your cup of tea but at least you went you know. You might meet someone in the audience or a reader might have one line that sticks out to you, so you just gotta go and be in the midst of the community and beautiful poetic atmosphere even if you don't talk to anyone there. Go to readings, don't be a dummy dumb dumb (I'm telling this to myself but also everyone else) it's one less regret and another great asset to your power as a writer and student of life. 2. Whose your poet/writer crush? or celebrity crush? Uhh, I don't know... Drake? lol.. he's pretty handsome, I've always been swooned by his looks But actually you know... Laroyce Hawkins, he plays Kevin Atwater on Chicago PD. yes... Chile...he's fine.. he's probably my celeb crush right now. I don't like to think that or wish that because then that plants a tiny seed in the brain, even when I/we don't think it does, that, what I am capable of isn't as good as whatever that poem is or the idea that I am not as good as that person/poet. What I wish I wrote was all the poems that I let pass by because they came at inconvenient times. The times when I was dead tired and all I wanted was to sleep. Those are the poems I wish I wrote. 4. In terms of writing, what scares you? What scares me is that you know.. as poets and writers (and readers too) we are pulled by the gravity of beauty in language and all that, so it's scary sometimes to think we can and we do miss the truth because its all dressed up in the beauty and that's what scares me. I'm all for a beautiful, awesome line/poem but I don't want to be so swooned by that, by the metaphor, by the sound that the truth is buried or misplaced or even nonexistent. I'm always on edge when I'm writing to make sure that doesn't happen. Also I am very committed to what I believe from a Christianity view, so sometimes I get nervous when I write and I have to work hard to make sure what I write isn't disrespectful or goes against God's word or that I don't use a metaphor in a way that I shouldn't be.. It's a scary thing to do that and I don't want to do that, with anything not just the Bible but with any topic or issue. Which is why I try to be extremely careful and precise and I make sure I am prayerful and I study, research--etcetera-- before and after I write. Basically I want a truthful/truth-filled poem over something that looks, sounds, is beautiful and also finding that balance-- because it is possible to have both though is not as easy as it sounds. 5. When it comes to your writing process, what do you struggle with most? I struggle a lot with titling my pieces. A title can do a lot for a poem but it also can give too much away or not do enough. Aside from a recommendation or requirement, we decide to read a poem based on the title but sometimes we decide not to read a poem because of its title and that's just a conundrum in of its own. I think I will struggle with it for the rest of my life and that's okay... everyone has their thing you know and I'm not the only one. I mean after all... titles are like the weather sometimes; they can be great and annoying at the same time. We can love and hate them at the same time. You know how people say, "I love summer! I can't wait for summer, its the best season ever! " and then when it gets here.. it goes from enjoyment to complaint, " it's so hot.. I just can't.. ugh!" Lol that's exactly how I feel about titles which is why it will be a life long perpetual struggle.